Even the most reliable machines break down from time to time. This is certainly the case with a furnace or heater, as they can work nicely for years before running into trouble. If you have recently had your heater stop working, call 5 Star HVAC Contractors for help. We have all the experience necessary to do this job the right way, and we provide excellent customer service in the process. 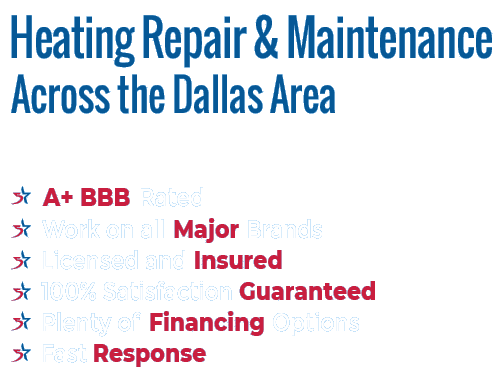 Countless homeowners in and around Rowlett have used our services over the years, and we hope you will be next! We take pride in being an honest company which deals fairly with each and every one of our customers. That means we offer upfront quotes, we don’t tack on hidden fees or unnecessary charges, and we don’t surprise you with an unexpected total when the work has all been finished. You will know exactly what you can expect to pay, and we will come to you if something comes up during the work that will require an added cost. Our team understands that you may not have been planning on spending money on a furnace repair job. While you need to have your furnace repaired as quickly as possible, you might not have the cash on hand to pay the bill. For that reason, we are happy to offer a variety of financing options. With the availability of financing, you may be able to lessen the financial burden while still having your heater fixed in a timely manner. Between our fair prices and the availability of financing, we make the money side of this project as painless as can be. Each repair case is its own unique challenge. The repair process starts by determining what exactly is wrong with the unit. Once we uncover the problem, you will be provided with information on the issue and what it is going to take to get the furnace back up and running once again. It is at this time that you will be able to sign off on the cost of the job, and we will get to work. To make sure we are able to find the problem quickly, the technician working in your home will be a trained and licensed professional. We don’t take any chances in terms of the individuals we put on our team – only the best is good enough to represent our business out in the field. You can count on our pros to find the problem, explain it to you in terms you can understand, and then make the fix. If we are being honest, service contractors don’t always have the best reputation for customer service. Sure, an individual might know how to fix a furnace, but do they know how to treat you throughout the project? 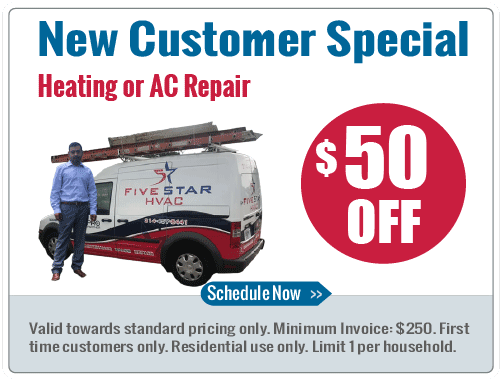 At 5 Star HVAC Contractors, they do. We take our customer service very seriously, as you are the most important thing in our business. Everyone on our team is trained to focus on the customer first and foremost. Before you choose another contractor to repair your heater, be sure to give us a call to find out just how committed we are to meeting your needs. Thank you for taking a moment to learn about the furnace repair services offered by 5 Star HVAC Contractors. Everything you have been looking for in a furnace repairman, you have found in the team here at 5 Star. We have experience, we offer fair rates, and we always stand behind our work. Thanks again for your visit, and please give us a call at your convenience to get started!